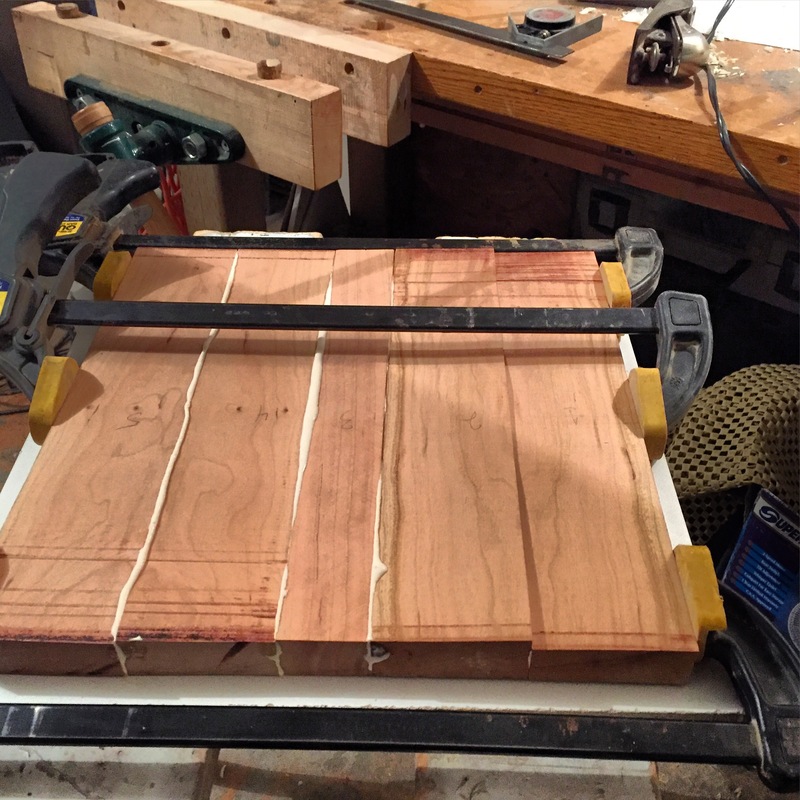 I came across a lovely bunch of rough cut cherry wood, which I have been on the hunt for since my last bread plate went to a good home in Fernie, BC. 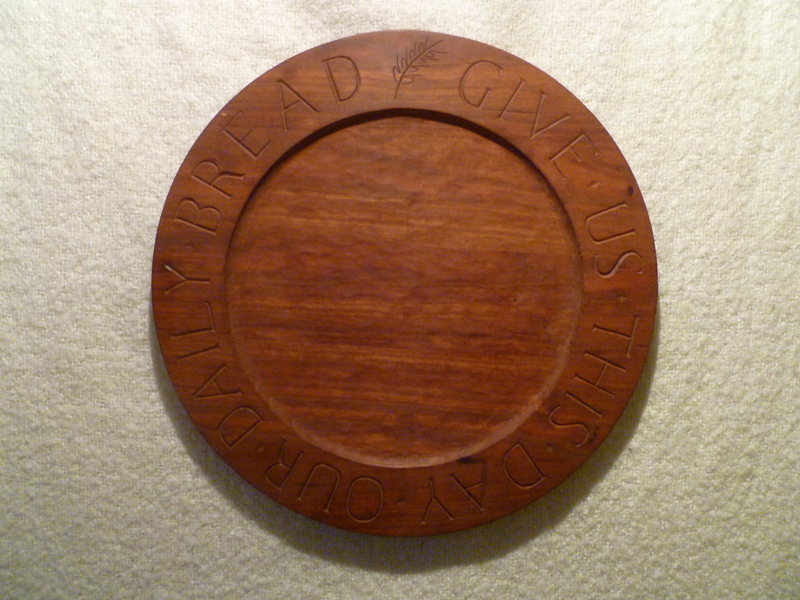 I have wanted to carve another similar plate, but as long-time readers of this site know, I need the perfect piece of wood before I can start. I went to visit my mom and while I was there I dug through dad’s old piles of lumber and found the perfect piece of cherry. I after rough-sizing the wood and jointing the edges by hand, I glued and clamped the wood together on a flat surface. I only need one flat surface for this project as the rest will be carved away. Next job is to cut a circle out of this board and plane it perfectly flat. This nativity set comes with a story. I started carving it in 2007, as a personal project. 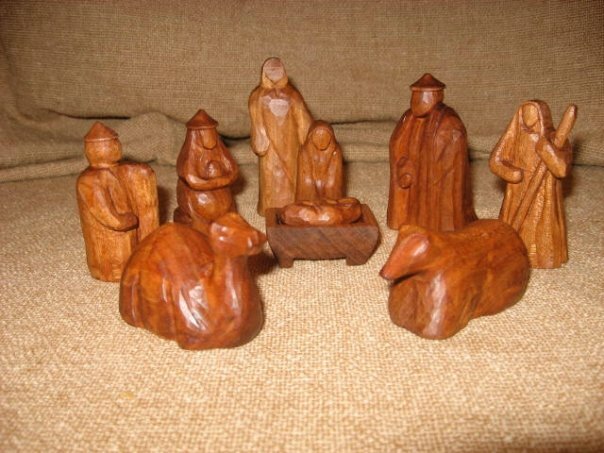 It was personal because the piece of cherry wood I carved it out of was a gift from my father. He brought the wood to me the last time he came for a visit. He had cut a large limb that he got while trimming a tree for a friend in the town of Hope. Unfortunately, in the process of drying, it developed a split that meant it wasn’t useful for making furniture, and he hoped I might be able to do something with it. It sat for a while as I considered what would be a suitable carving. In the meantime, my father passed away from cancer, which somehow made the importance of what I carved with that piece all the greater. My father, Victor McMillan, was a committed Christian and someone who made a significant difference in the lives of many people. This was evident at his funeral which saw well over 500 people in attendance. That Christmas season, as we unpacked a nativity set that he had made for our family, I knew exactly what I would carve: a nativity. It suits my father because it is representative of his Christian faith and the difference that following the Baby Jesus can make in anyone’s life. That old cherry tree limb found new life too – in this carving! It is sold now, to a family that knew and were influenced by my dad. How appropriate! Approximate size of the largest character is 3″. The wood is cherry, finished in many coats of natural tung oil, hand rubbed between coats. This is a one-of-a-kind carving from a unique piece of wood, carved in memory of a unique man. What I enjoy most about wood carving are the never-ending challenges. First comes the challenge of a good design. I hope to design carvings that are pleasing to the eye and create the impression of wholeness. Second comes the challenge of the material. Wood is always unique. There are no two pieces of wood that are the same. Different types of wood create different effects and allow or limit the carver’s options. For example soft woods are difficult to carve intricate detail into because the grain can crush or simply not be strong enough to hold up under the carver’s gouge. Hard woods, on the other hand, can take any amount of detail, but take much longer to carve. Also, different types of wood have colour and grain uniquenesses, and knowing how these work with or against the design is important. Third comes the challenge of executing the design in a special piece of wood and bringing all the elements of skill, design, and material to form a piece of art. 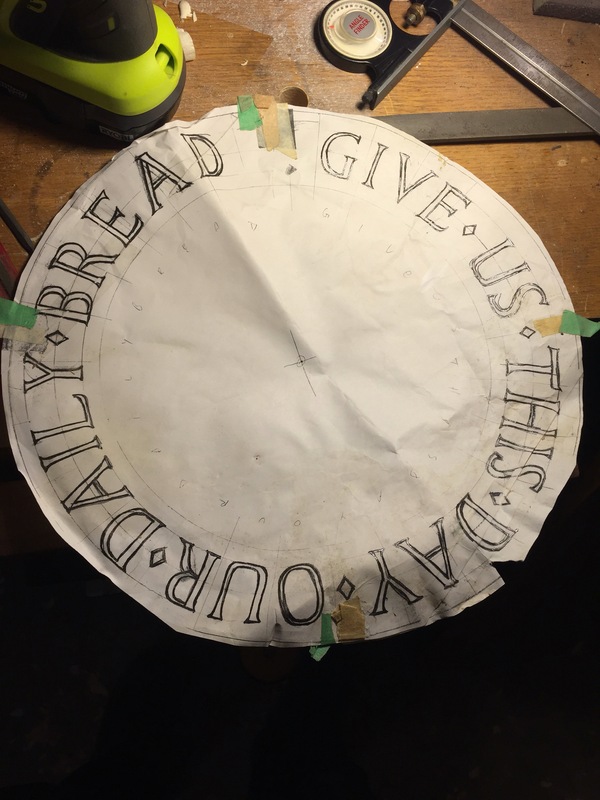 This is a bread plate that is 18″ in diameter and 1″ thick. It’s carved in Cherry wood which naturally oxidizes and turns the rich reddish/brown that you see here. It’s finished in a food safe oil and beeswax blend. The phrase is taken from the famous “Lord’s Prayer” passage in the Bible (Matthew chapter 6, verse 11). Carving letters around a circle is more difficult than I first imagined. I hadn’t realized that the outside of the circle would be longer than the inside. Stretch a string around the inside of circle below the letters and then again around the outside of the rim of the plate, and you’ll find aproximately one and a half inches difference in length. The design of the letters and the spacing of the top of the letters and the bottom of the letters all has to take that into account. I ended up using a compass and protractor, drawing rays from the centre out to where I thought each letter should be. I spent many hours figuring out the spacing and drawing each letter to fit the spacing, and I enjoyed every minute of it. The symbol at the top of the plate is a stylized stalk of wheat. I designed and carved this while we lived in Saskatchewan. Our house overlooked a wheat field, literally a few steps behind our house, which was a daily reminder that we lived in the Bread Basket of Canada. I jogged past amber waves of grain daily in the summer and early fall and often thought about how I might incorporate some of that beauty into my carvings. This one is in a private collection, as are 5 of 6 others carved in oak, walnut and maple and I can carve you one of your own for $150. Other phrases are also possible too! Send me an email at gvmcmillan@gmail.com to commission your own.